For the month of July 2017 a silent auction was held at Ideal Vapor of Portage to help the Portage Family Skate Park Project raise money for new additions to the Skate Park! Every Donation made at Ideal Vapor, LLC V2 entered you to win one of five skate decks on display in the store. The Winner was chosen on Monday, July 31, at noon. Pictured below is the winner. With special thanks to the Lenz Foundation all donations will be matched up to $37,500! We would also like to thank Elements Boardshop, and Millennium Skateboards for their generous donations of skateboard decks. 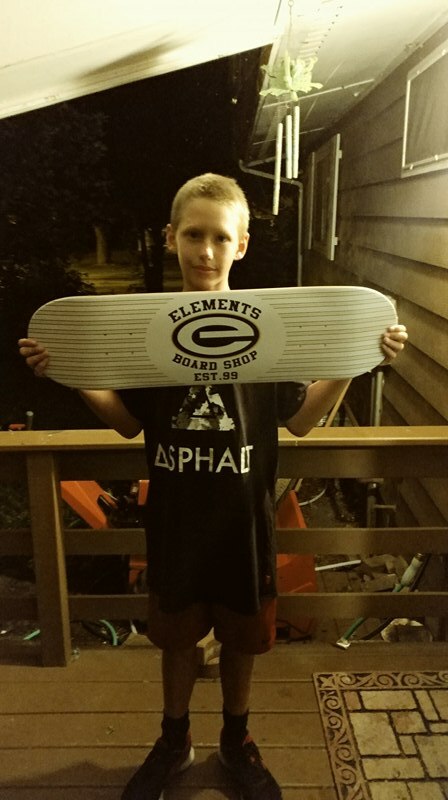 Dominic Greer won himself an official Elements Board Shop EST. 99 deck!